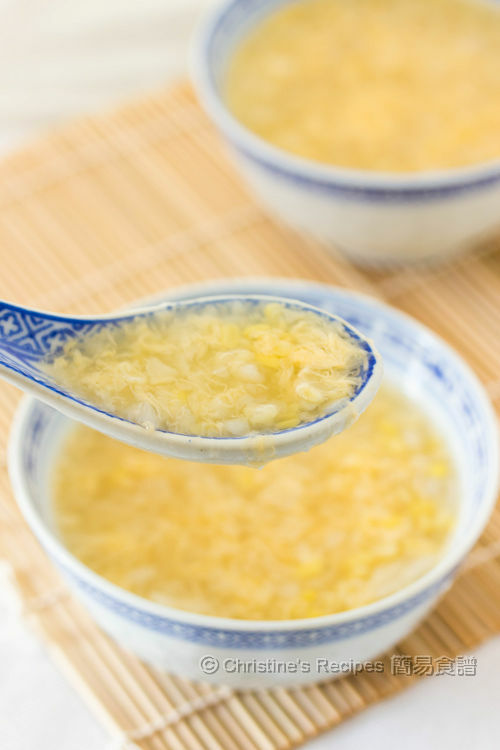 Ever tried this traditional Chinese dessert, water chestnut sweet soup? I used to buy a whole packet of frozen water chestnut to make water chestnut cake. The leftover water chestnut can be used to make this dessert. Its crunchy texture and delicious taste totally win my heart. Water chestnut cake is a must-eat snack during Chinese New Year. But I won’t wait a whole year to enjoy crunchy and tasty water chestnuts. Its mild sweetness is so pleasant. They can be eaten on its own. 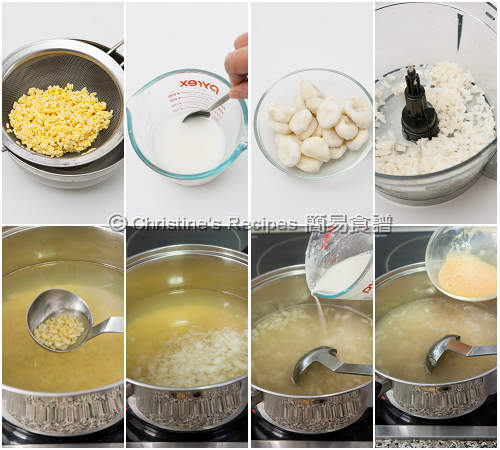 For cooking, I’d like to put some water chestnuts in my pork patties or make myself a sweet treat, like this Chinese dessert soup that I grew up with. This sweet soup can be served hot or cold. It’s comforting on cold days and refreshing on hot days. Oh yeah, the egg drops are the highlight too, feeding my stomach as well as my eyes. This sweet soup looks very appealing, isn’t it? Soak the mung beans for 3 hours or overnight. Drain well. Set aside. In a large pot, pour in the water and bring it to a boil. Add the mung beans. Cook until it boils again, covered. 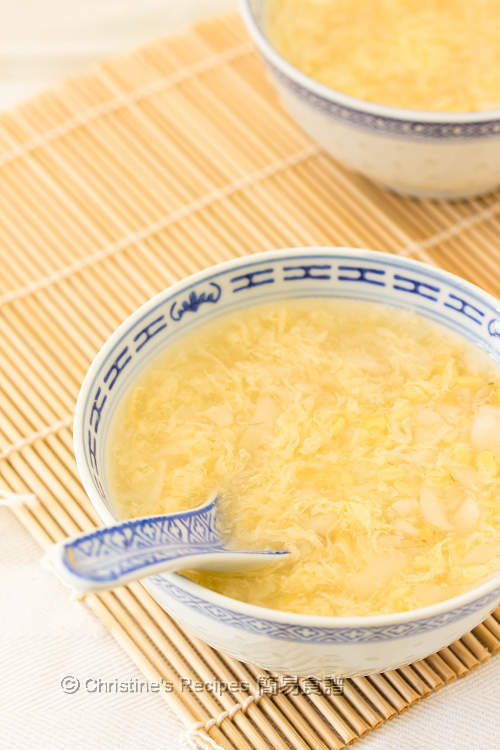 Reduce heat to simmer until the mung beans are softened, for about 20 minutes. Add rock sugar and cook until completely dissolved. While cooking the mung beans, pulse the water chestnuts in a food processor for a few seconds into smaller pieces. Or you may use a knife to chop them finely. If you like smoother texture, you can process them into a paste. I like to retain some crunchy bits in the soup. Mix the thickening thoroughly. You may need to press the water chestnut powder with a teaspoon in order to help it dissolve completely. Add the chopped water chestnuts. Pour in the thickening and stir as you go. Bring it to boil again. Turn off the heat. Slowly stir in the whisked egg and let it spread out into ribbons. Served hot. The leftover can be chilled in fridge and then served cold. Water chestnut powder is available at Asian grocers. Click to see the picture of it. The amount of rock sugar can be either increased or decrease to your liking. This is a very comforting dessert. I will enjoy this warm or chilled. Thanks for sharing! 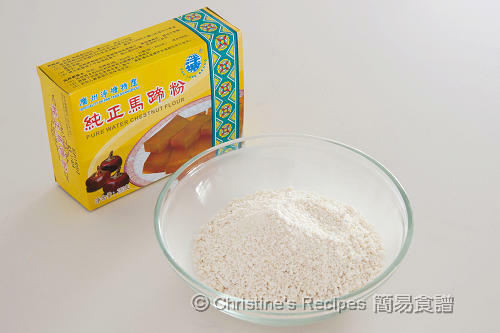 Most helpful when you post pic of certain ingredients used, eg : water chestnut powder, that I never even knew it existed. Thank you . I've already posted the link to the photo that I posted before. As requested, posted the water chestnut powder photo again here. Hope it helps. Hi Christine, can i sub potato starch for the chestnut flour in this recipe? thanks. Love all your recipes. 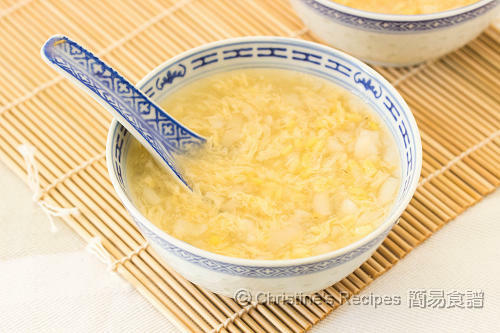 You may use potato starch instead to get the soup thickened if you won't mind not getting the translucent effect as water chestnut flour produces. I miss this dessert! I love it well chilled!! Hi Christine, is there other alternatives for water chestnut powder? I think i might not be able to find it in my place. The water chestnut powder can produce a translucent effect that any other powder can't do the same. But if you are keen to try the taste, you can use corn flour/ corn starch instead. You might test and add a bit by a bit and cook to your desired consistency.